Feb 23 Is the War on Money Laundering in Crisis? The short answer is yes, at least in some countries. In the Americas, in particular, we are witnessing a dramatic era. Concealing sources of dirty money is a crime; yet, the risk is profitable for criminal enterprises. The United Nations Office on Drugs and Crime estimates that gross profits of drug traffickers operating in South America reached the amount of USD 18 billion in 2009 – made possible in large part by laundering their profits through legitimate business fronts. Although governments have enacted anti-money laundering (AML) laws and ratified international conventions on the matter, the evil of easy money keeps growing in the region. The U.S. Government recently sanctioned Venezuelan’s vice president, Tareck El Aissami, for playing a significant role in international drug trafficking and money laundering. Odebrecht, a Brazilian government contractor, acknowledged that it paid millions of dollars to government officers in South American countries to win government contracts. There are allegations that government officers had to launder the money that came from the bribes. Former Peruvian president, Alejandro Toledo, and Colombian president Juan Manuel Santos’ 2014 presidential campaign, allegedly received funds from Odebrecht. Tax evasion is also a problem. The FBI says it has found millions of dollars in taxable income hidden in offshore accounts in the Caribbean. The Panama Papers scandal exposed the offshore accounts that were used to hide funds and account holders’ identities via bank secrecy protections in tax haven countries. Challenges in combatting these issues range from financial burdens on banks imposed by AML laws, to corruption and a rule-of-law deficit in the region, and the lack of smart enforcement policies in the prosecution of money laundering. It is therefore proper to outline the legal framework of the war on money laundering and then discuss these challenges in turn. Governments’ interest in creating legal ammunition to prosecute money laundering is centered on the threat to economic stability and the financing of terrorism, which can endanger international peace and security. Essentials of the legal framework of the war on money laundering are drawn from the following two clusters: First, United Nations Treaties, such as The Palermo, Vienna and Merida Conventions, as well as FATF recommendations, enacted by the Financial Action Task Force, which is an intergovernmental organization that develops policies to combat money laundering. Second, statutes passed by the U.S. Congress, such as the Bank Secrecy Act, the Money Laundering Control Act, and the USA Patriot Act. However, because the economic and security interests protected are bigger than any one country, all governments across the Americas must cooperate to jointly prosecute criminal organizations devoted to money laundering. The money laundering crime must have its origin in a specified unlawful activity, such as drug or human trafficking, smuggling of migrants, corruption, fraud, and other white-collar crimes. The money must be laundered through monetary transactions (such as deposits, withdrawals, or transfers) and carried out by or through financial institutions. The suspect should know that the money is derived from criminal activity and should have the intent to conceal the origin of the funds. Financial institutions across the Americas must comply with AML laws. For example, banks in the U.S. must investigate and report a customer’s suspicious transactions to the U.S. Government. By reporting suspicious activity, banks play a critical role in detecting large-scale criminal organizations, which need to place the proceeds of their unlawful activities into the economy without any trail to the criminal origin. Nonetheless, the duty to prevent, detect, and report money laundering is costly. In the U.S. alone, experts estimated that $7 billion is spent annually for putting AML compliance programs into operation. The costs, for the most part, are most likely to be transferred upon customers via fees. A better approach to help the financial system endure the burden of compliance with AML laws could be the allocation of funds-grants by multilateral banks amongst financial institutions. Regional multilateral banks, such as the Inter-American Development Bank, would grant funds to financial institutions to enhance the use of new technologies in the fight against money laundering and to counter the funding of terrorism. Corruption and rule-of-law deficits pose serious challenges to the war against money laundering in the Americas. Countries with high levels of corruption and a rule-of-law deficit are most likely to have weak or no AML laws in place. In Venezuela, for example, illegal proceeds from food trafficking run by the military are getting the attention of the U.S. Government. Under President Maduro’s instruction, the military is managing the country’s food supply. The military is allegedly engaged in illegal markets wherein supermarkets’ representatives must pay bribes to the military to access the food supply, which is then sold to Venezuelans. This activity is considered a red flag for money laundering, as members of the military are allegedly laundering the proceeds of food trafficking in the U.S. financial system. In Colombia, meanwhile, the peace agreement between the government and FARC, which the U.S. Government considers a terrorist group, as well as resulting amnesty laws passed by the legislature, can deter Colombian law enforcement agencies, as described by The Economist, from trying to track down FARC’s dirty money, which is being estimated to be up to $10.5 billion and which comes from its criminal activity such as drug trafficking, illegal gold-mining, kidnapping and extortion. Smarter enforcement plans in the prosecution of money laundering are necessary across the Americas. In times of fiscal deficit, criminal justice systems in the region need to efficiently use government resources to focus their efforts on prosecuting the most serious crimes. The U.S. Smart on Crime Policy can be seen as a model for other governments in the Americas to ‘go smart’ on crime. Money laundering and the financing of terrorism must be on the list of their smart enforcement plans. In conclusion, the war on money laundering, in some countries in the Americas, is in crisis due to corruption and the rule-of-law deficit problem. Governments must focus their efforts to go smart on crime, including the prosecution of money laundering and the financing of terrorism. Multilateral banks can step in to economically assist financial institutions to strengthen compliance with AML laws in the region. Together, these approaches mutually reinforce one another and create stronger institutions to combat money laundering across the region. Juan Carlos Portilla is an international lawyer who currently works as an Anti-Money Laundering Compliance Analyst at Santander Securities LL.C, U.S. in Boston, MA. He was a visiting scholar at Boston College Law School where, summoning resources of BC Law Faculty and students, he filed a petition with the United Nations Human Rights Committee on behalf of a Venezuelan student activist who was a victim of unlawful detention. Juan Carlos’s client was released from detention. 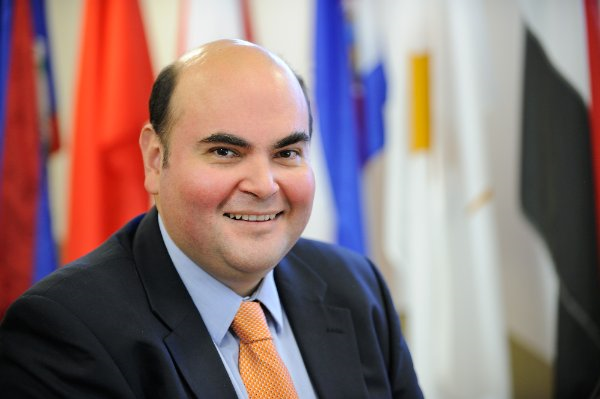 Juan Carlos studied law at Sabana University School of Law and holds a master of laws in international law from the Fletcher School of Law and Diplomacy, Tufts University. He has worked as a diplomat and, in 2009, Colombian president Alvaro Uribe appointed him to be Superintendent of Surveillance and Private Security at the Colombian Defense Ministry. As Superintendent, Juan Carlos shut down private armies with links to drug trafficking and organized crime, demonstrating his commitment to tackling criminal activity in the private security sector. Juan Carlos currently is also pursuing his second LL.M in American Law and U.S. Legal Practice at Suffolk University School of Law. Disclaimer: The views and opinions expressed in this article are those of the author and do not reflect in any way those of the Santander Group and its subsidiaries, including Santander Holdings USA and Santander Securities LLC. Dec 17 Can The Hague Bring Justice to Venezuela? Sep 26 Prosecuting Bashar Al-Assad: Can The International Criminal Court Exercise Jurisdiction Over Syria?